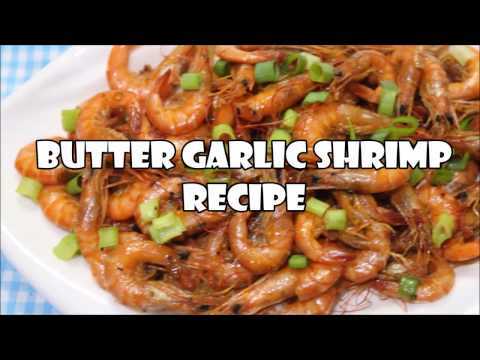 Butter, Garlic Shrimp Recipe is so easy and quick to prepare but tastes so good that many restaurants include this on their regular menu like the night markets, better known as “Dampa”. This is the reason why some call this dish as Dampa Shrimp. The traditional way of preparing this Butter, Garlic Shrimp is by marinating the shrimp into Lemon or Orange Soda then stir fry it using butter with lots of garlic. You can serve as an appetizer with your favorite alcoholic beverages or beer as pulutan. In a deep bowl, pour the Lemon or Orange Soda then add the shrimp. Marinate the shrimp in soda for about 15 to 30 minutes. Add the shrimp and then cook until the color turns orange. Pour the remaining lemon or orange soda marinade. Turn the fire to low then simmer until the liquid evaporates completely. Add ground black pepper, chili flakes and salt as needed. Sprinkle with scallions on top. Serve hot with steamed rice or your favorite beer. This butter garlic shrimp recipe sounds very delicious, will definitely have to try this recipe on my family, we love shrimp. Mmmm!! These look delish!! I am such a sucker for shrimp!! Im not sure I could cook them with their little heads still one though lol!! I’d love to cook shrimp with the shells on like this, I know it gives a lot more flavour. This butter garlic shrimp recipe looks easy to follow and sounds delicious. Thank you for sharing. this looks tasty… may have to pin it ! This looks amazing. I will have to try it sometime. The best shrimp dish . I really love combining garlic and shrimp together. The shrimp looks so delicious and easy to make! Yes it is, and very delicious! Thank you for dropping by Marcie! This shrimp looks absolute irresistible! Ooooh Ive been craving shrimp like crazy lately!! This sounds like its fantastic!! I love how easy! I will definitely give this a try! I love garlic shrimp. This recipe looks delicious. The shrimp looks so delicious! I can’t wait to try it. The shrimp recipe that is so easy to do. When you can get the freshest shrimp in the market you can taste how sweet the meat of the shrimp which is my daughter’s favorite.